Eight employees from Wycombe based 5G Communications headed across to Amsterdam on October 19th 2015 to complete the city Marathon and ½ Marathon. As they put their bodies though so much pain they thought that someone should benefit and decided to raise money for a national and local charity. We were lucky to be chosen as the local charity they wanted to support and they generously presented Anita with a cheque for £1532. 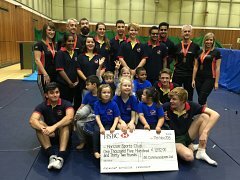 We’d like to congratulate them on their huge achievement and thank every one of them for raising so much money for Horizon Sports Club. Photos of the runners from 5G presenting the cheque to Anita and the children in the Tuesday Athletics class will be coming soon!